Carrie Fisher was a popular American writer, actress, and humorist most famous for her performance as Princess Leia in the Star Wars franchise, which started out as a trial which has now grown to become a billion-dollar generating series. She also has best selling novels under her belt and they include Wishful Drinking and Postcards from the Edge. Throughout her acting career, she interpreted iconic roles despite her struggle with bipolar disorder and later drug addiction. More about her below. Carrie Frances Fisher (October 21, 1956 – December 27, 2016) was born in Burbank California to famous parents. Her father, Eddie Fisher and her mother, Debbie Reynolds were both famous for acting and singing. In 1959, at the young age of two, her parents filed for a divorce. Her father later went on to get married to actress, Connie Stevens. This marriage happened to be his third and it produced her half-sisters whose names are Tricia Leigh Fisher and Joely Fisher. Her mother, on the other hand, got re-married to Harry Karl, a big-time businessman and owner of a good number of shoe chain stores. This marriage didn’t last as Carrie’s mother and step-father Karl went their separate ways through a divorce in 1973 when Carries was 17. As a kid, she loved reading books and fascinating literature. She studied at the Beverly Hills High School until she was 15 years of age where she then got the chance to be a debutante on the hit Broadway show, “Irene” alongside her mother, Debbie, in 1973. Due to the time spent on Broadway, it affected her schooling, therefore, she decided to drop out of high school. In 1973, Carrie was then enrolled at the London’s Central School of Speech and Drama, a course which lasted for 18 months. While she was there, she applied and was given admission into Sarah Lawrence College, to study the arts. However, she couldn’t complete it because of her increasing fame. In 1975, Carrie Fisher appeared in her very first movie when she was given the role to play a seductive character known as Lorna Karpf, in the comedy movie, “Shampoo” at just 18 years of age. By age 19, she was cast in one of her most iconic roles in Star Wars: Episode IV – A New Hope which would span decades of a successful career. 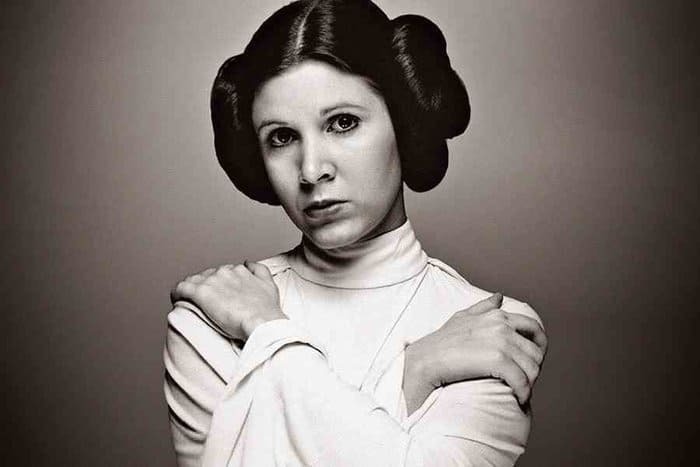 She played the role of “Princess Leia” in the movie. She also received several nominations for her acting prowess including three Saturn Awards nominations. She had a good career with lots of blockbuster movies under her belt including The Blues Brothers (1980), Hannah and Her Sisters (1986), The ‘Burbs (1989), Soapdish (1991), Women (2008), Maps to the Stars (2010), Star Wars: The Force Awakens (2015), and Star Wars: The Last Jedi (2017). The latter was released posthumously. She worked as a script doctor on other writers’ screenplays. Some of the most notable include Hook (1991); the smash hit 1992 movie, Sister Act which featured Whoopi Goldberg, plus, most of the Star Wars series. Breaking into the industry at just 19 years of age with a successful career in movies and television spanning decades, Fisher made a fortune in her chosen field. Her talent and beauty made her a sought-after actress who was earning some big bucks back in the day. Coupled with the fact that she featured continually in one of the highest grossing movie franchise of all time (Star Wars series), she was financially covered. Her estimated net worth is reported to be well over $25 million. Carrie Fisher has been in quite a number of highly publicised relationships in her lifetime. She began dating the famous musician, Paul Simon, in 1977 during her time on set as a part of the Star Wars cast. Their relationship however ended in 1980. She and Simon later got back together and walked down the aisle in 1983 and by July 1984, they separated for good. Fisher began dating again, this time she had a steamy relationship with Creative Artists Agency principal and casting agent, Bryan Lourd. Though they didn’t tie the knot, they both had an adorable daughter named Billie Catherine Lourd on the 17th of July 1992. 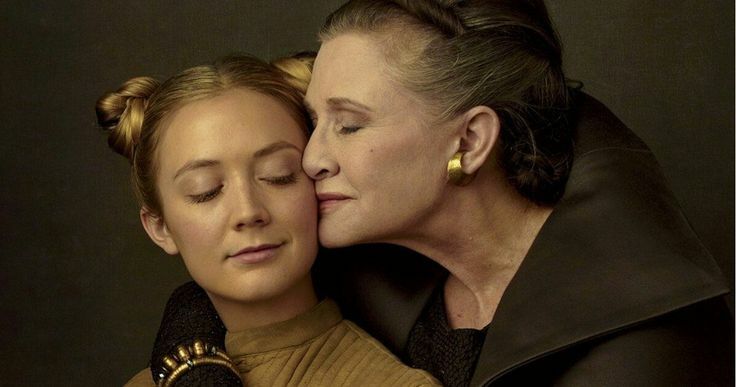 Today, Billie Lourd is an actress as she decided to follow in her mother’s footsteps. In 2015, she appeared in Star Wars: The Force Awakens, where she played the part of Lieutenant Connix. She also reprised her role in the follow-up installment Star Wars: The Last Jedi in 2017, this time starring alongside her mother. Currently, Billie is part of the cast of the Fox TV series, Scream Queens, where she plays the role of, Chanel, a rich and disaffected sorority girl. Carrie Fisher recently revealed that she has always struggled with weight and admits that her love for the soda brand “Coca-Cola” might be attributed to the continuous weight gain. She, however, was told to lose weight to fit properly into her role in the 1977 Star Wars movie (later retitled Star Wars: Episode IV – A New Hope, which was the first of the franchise), even though she was 19 years of age at the time. On her reprisal role for the 2015 Star Wars comeback, Carrie at age 60 was told to lose weight also for the role, which she did. Soon after the completion of the movie, she had a heart attack on a commercial flight from London en-route Los Angeles. A passenger seated by her noticed she wasn’t breathing anymore and quickly performed C.P.R on her. After the plane landed, she was rushed to the in intensive care at UCLA Medical Center, unfortunately, Carrie lost the battle four days later. She died on December 27, 2016. Though experts posited the possibility of her death to be as a result of the strain on her heart stemming from both bad dieting and an attempt to lose weight quickly, an autopsy revealed that she had cocaine, heroin and other opiates in her system. She was 60 years old at the time of her death.